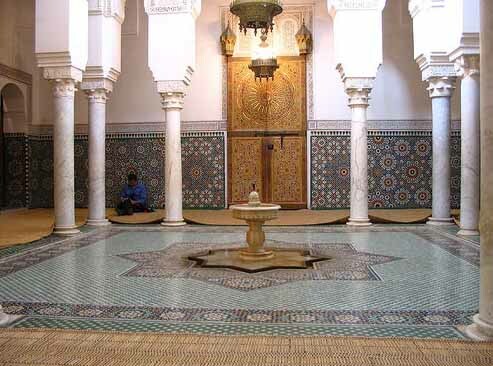 Moroccan architecture and interior design is very diverse, both throughout history and locally. 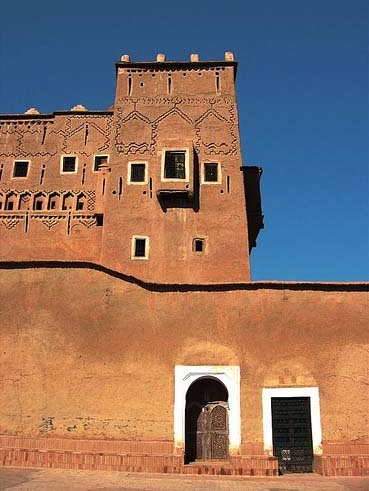 While many different cultures have influenced Moroccan design, traditional Moroccan architecture can be divided into two general categories: Andalusian and Southern Kasbah. 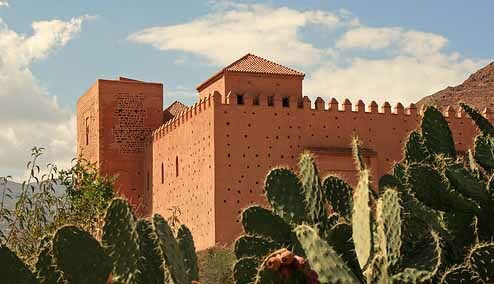 Andalusian architecture is more complex and refined and was most developped from the 10th to 18th centuries. 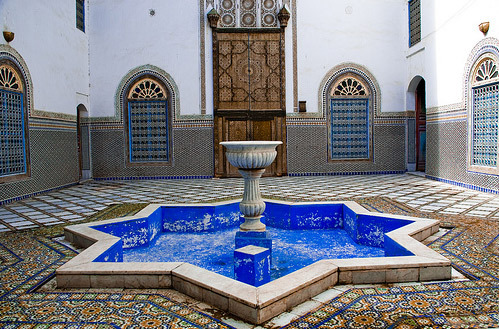 Southern architecture is much more ancient, having been developped centuries before Arabic architecture was introduced in Morocco, and is simpler but none the less stunning in its elegance, efficiency and beauty. 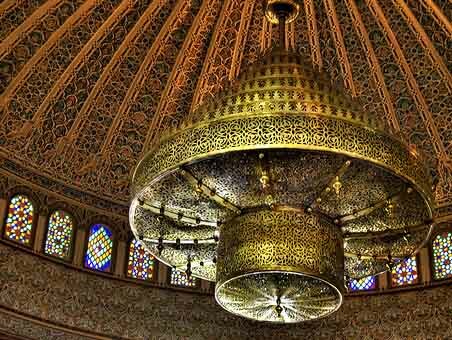 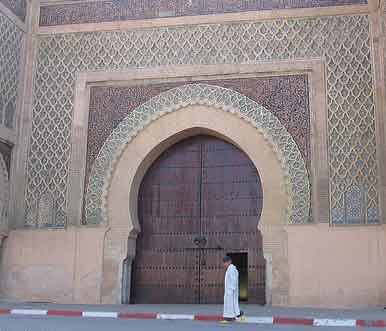 Meknes, Fes, Rabat and Casablanca hold the best examples of Andalusian architecture. 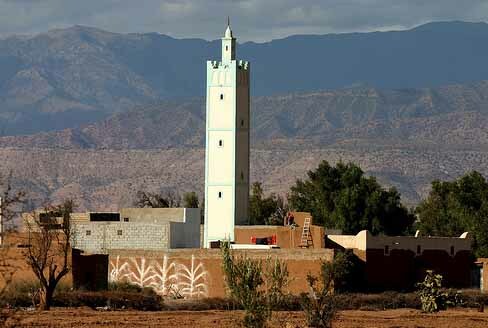 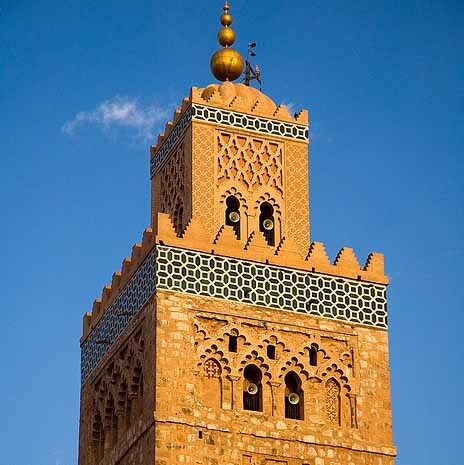 The Deep South, especially Ourzazate and Taroudant, along with the surrounding areas of Fes and Meknes in the Middle Atlas, have the greatest examples of Southern architecture. 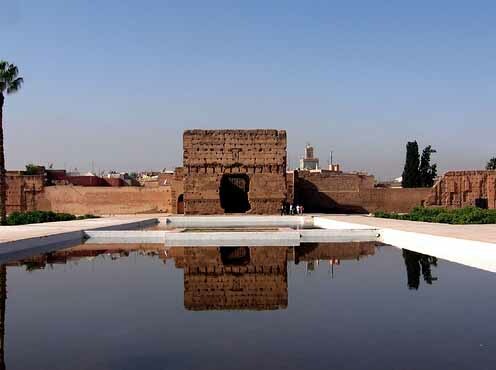 Marrakech, which is becoming an international capital of design and culture has become, without a doubt, the most architecturally vibrant and dynamic city in Morocco. 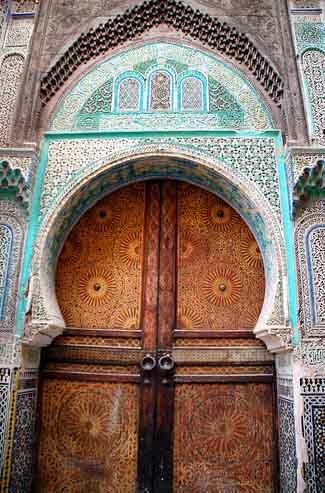 Andalusian architecture is more commonly known around the world as Hispano-Mauresque (from the Andalusian days of the Moroccan empire). 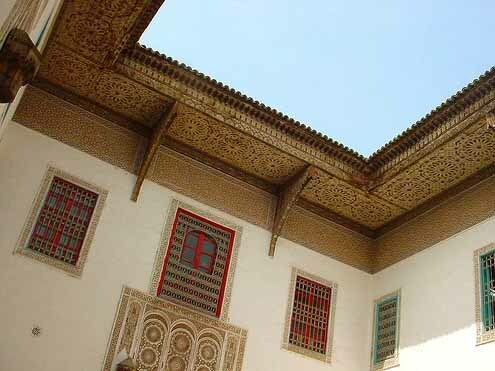 The Andalusian style is diverse but certain traits are characterisitc such as white walls, green stucco roofs, central courtyards and zellige decorations on walls, floors and ceilings. 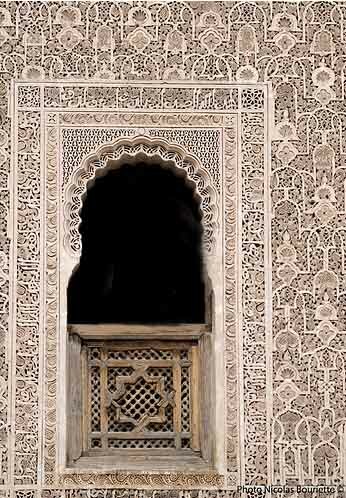 Andalusian architecture fascinates because its scale can be so great without ever sacrificing an extraordinary attention to detail, as seen in the doors, walls, floors and ceilings of these magnificent structures. 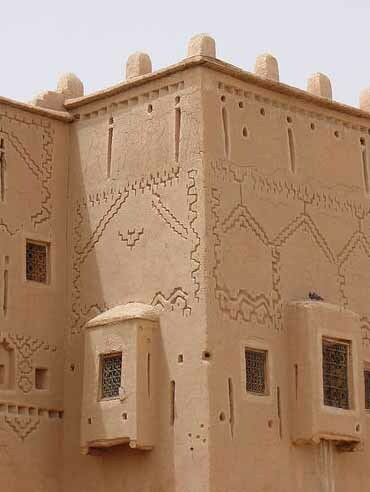 Southern architecture is very simple, using simple materials and techniques to create structures extraordinary in scale, efficiency and harmony. 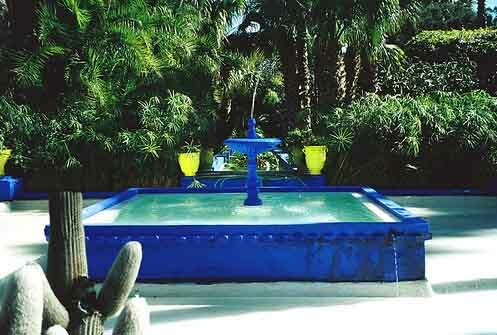 The most impressive aspect of Southern architecture is its harmony with its environmental surroundings. 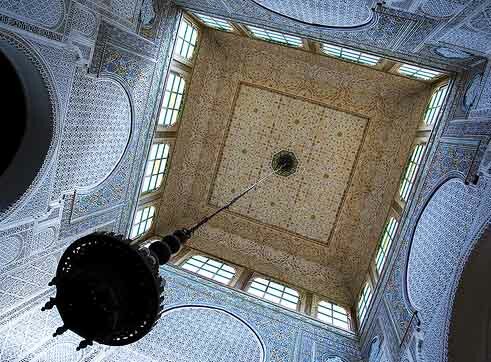 Southern architecture was eco-friendly centuries before the word was coined. 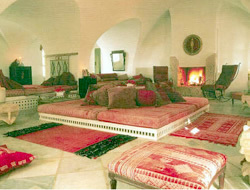 Interiors stay surprisingly cool during the day despite the hot sun and relatively warm during the cold nights. 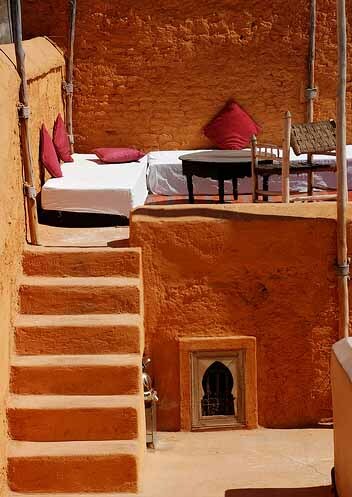 The tan color schemes, ranging from deep browns to vibrant oranges, help the structures blend into their environment. 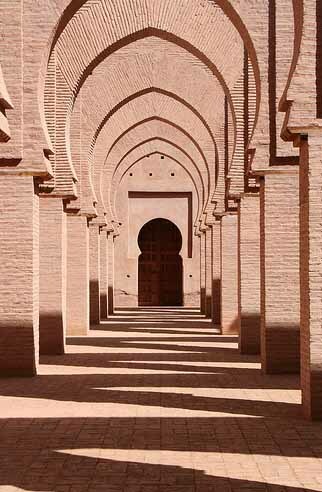 Sometimes the simplest things are the most impressive, and traditional Moroccan engineering and architecture are no exception. 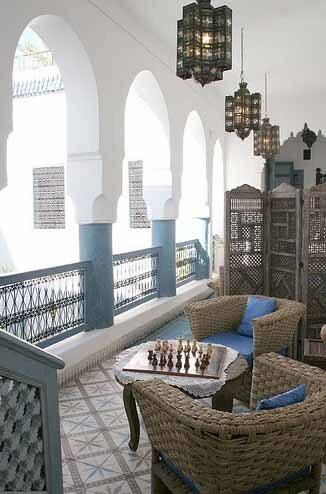 Moroccan architecture has witnessed an extraordinary renaissance in recent years as architects and interior designers from Morocco and around the world have taken an interest in Moroccan design elements big (courtyards) and small (lamps), rethinking and updating them. 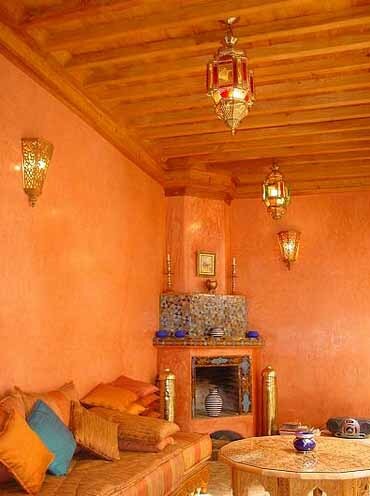 Neo-Moroccan architecture is luxurious and simple all at once, emphasizing a great use of space by leaving certain areas simple and sparse and overloading other areas. 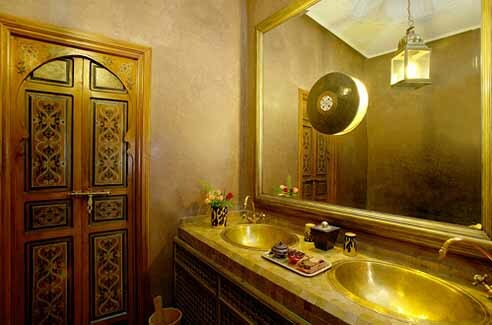 The Neo-Moroccan style combines the simplicity and harmony of the Southern Kasbah style with the decadent luxury and refinement of the Andalusian style perfectly. 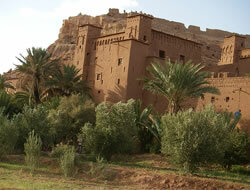 European and Asian art have a great history of depicting living creatures in murtals, painting and sculptures. 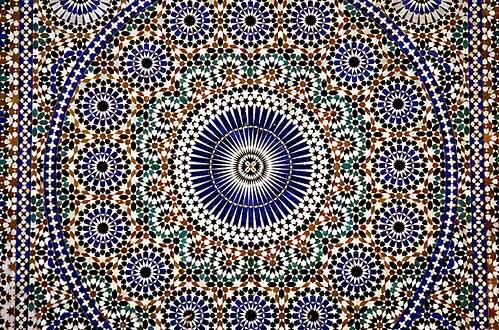 Islamic art, however, is based around abstraction and calligraphy with a strong emphasis on patterns, geometric shapes, colors and symmetry. 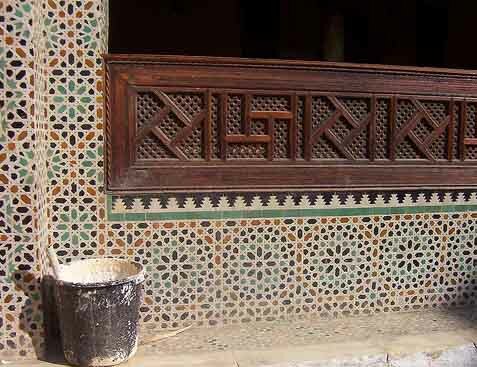 Zellige is an intricate mosaic with recurring geometric patterns. 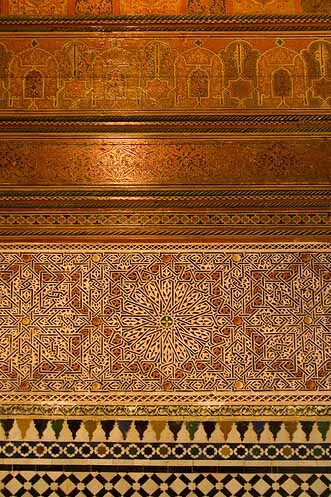 This same style can be seen on intricate wood carvings. 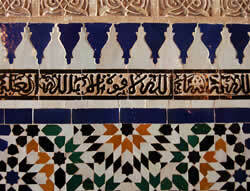 Moroccan metal work favors Arabic calligraphy. 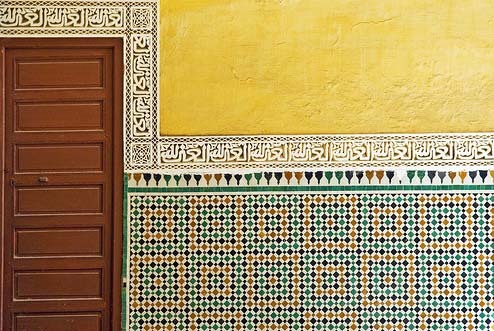 Both the interiors and exteriors of Moroccan architecture are embellished with extremely detailed and complex geometric patterns and calligraphy. 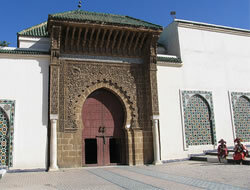 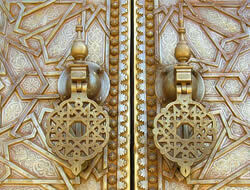 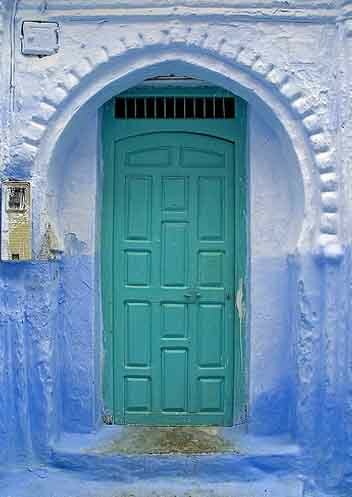 Moroccan doors are renowned for their beauty and the amazing craftsmanship which goes into them. 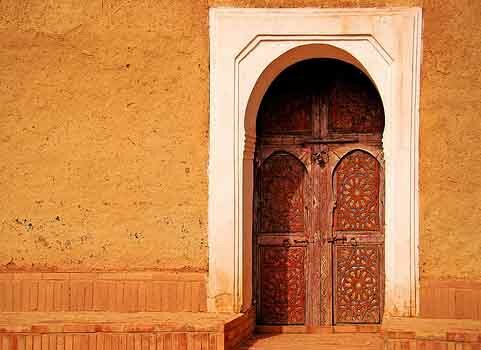 In the older sections of Moroccan cities, many luxurious riads on the exterior appear very plain with the exception of the front door which is richly detailed and made of fine wood or metal. 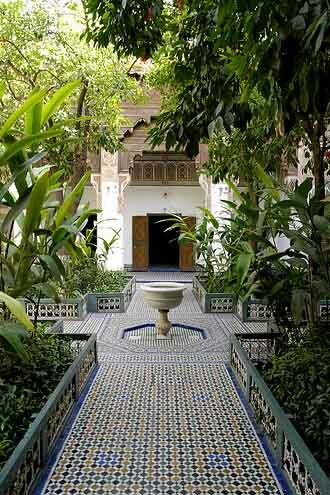 Moroccan homes are very private and most lack a front garden or backyard. 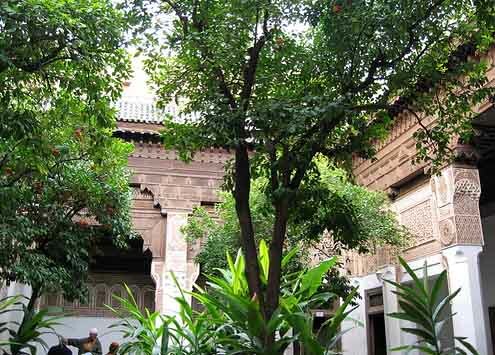 Instead, they open up the center of a house as a courtyard. 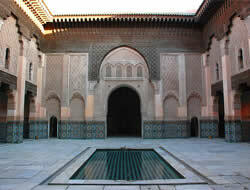 The typical Moroccan courtyard has a foutain or pool of water in the middle of a garden.